Well, we all knew this wouldn’t take too long with the wonderful android developers we have. When the Iphone 4S was debuted their main selling point was Siri, which I admit is cool but not enough to make me jump ships. It was obvious that in time something like Siri would make its way to Android. Now it is here, well kind of. When we started seeing results, everyone got excited and started a high speed coding race. 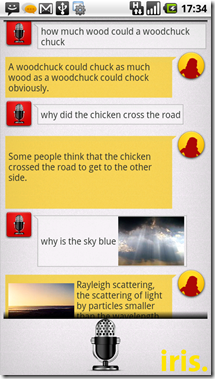 In no time, we added Voice input, Text-to-speech, also a lot of hueristic humor into Iris. Not until late evening we decided on the name “iris.”, which would be Siri in reverse. 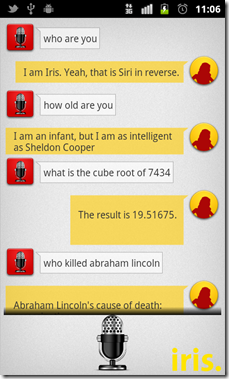 And we also reverse engineered a crazy expansion – Intelligent Rival Imitator of Siri. We were still in the fun mode, but when we started using it the results were actually good, really good. Well, this may have started out as a fun joke, but now its serious. 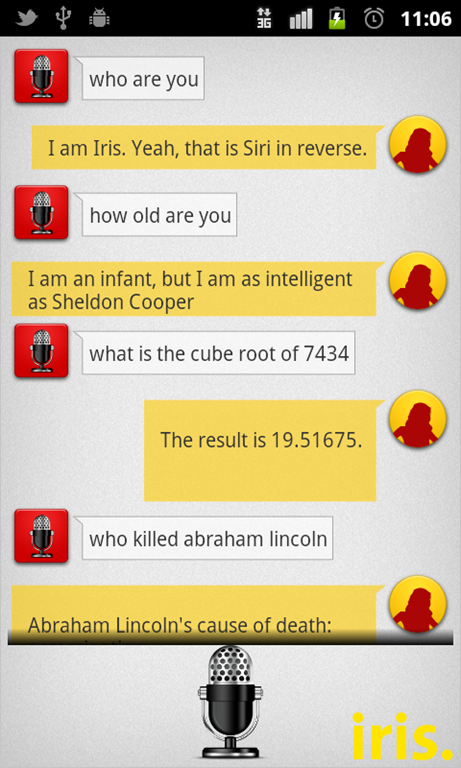 The app searches Wikipedia for information as to what you ask. You can ask a bunch of things about topics such as biology, math, science, literature, art, and history. For example I asked “what is two times eight?’” it told me “16” Others asked funny things like jokes, so it does answer a variety of things, pretty much anything that is on Wikipedia. So for, 8 hours I say it is not bad. It is still rather slow when answering but this is still only in alpha and will be on the market in a week or so. I can see them taking this very far in the future and good things will come out. I can see this app doing task for you as well as answering questions. Want to try it out now click here, remember the app is still way early in development and only took 8 hours to build so be patient and see what the future brings. 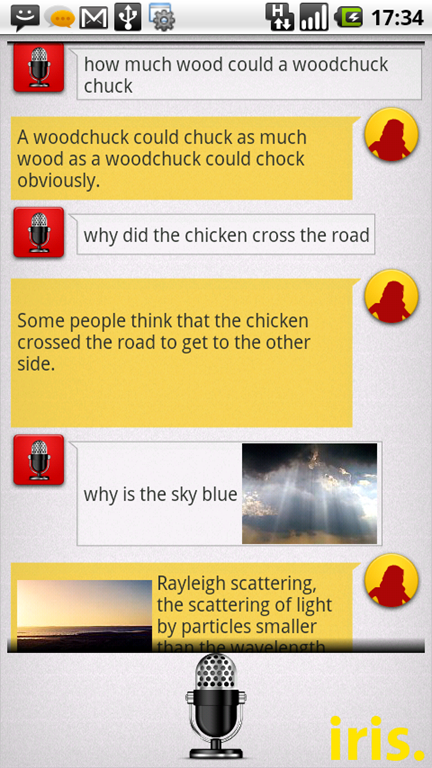 I just tried this, and it woudn’t answer a single question, They did great with the sarcasm though.